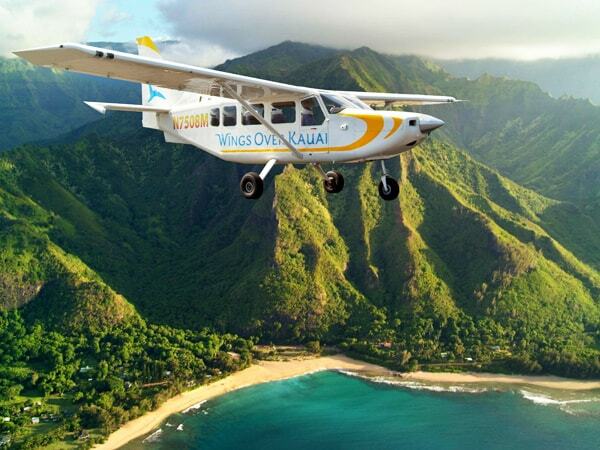 Enjoy a spectacular airplane tour of Kauai's most beautiful sights. Departing from Lihue, you'll first fly southwest to see the beach that was made famous by Harrison Ford in the movie 6 Days and 7 Nights - Kipu Kai Beach. From here, the tour continues on to another popular attraction you might recognize from the movie Jurassic Park - the waterfall nicknamed Jurassic Falls (weather permitting). Then fly over the immense Waimea Canyon in the center of the island, also known as the "Grand Canyon of the Pacific." Heading north, you'll get to the the otherwise inaccessible Na Pali Coast, with its many hidden bays, sea caves, waterfalls and cliffs. Then enjoy the view of scenic Hanalei Bay and Bali Hai and the numerous waterfalls behind Hanalei Valley. You'll also get to see the crater below Mt. Wai'ale'ale, one of the wettest spots in the world. Only Wings Over Kauai features an expert agricultural narrative (created by owner and chief operating pilot, the research scientist, Dr. Bruce Coulombe). This is a truly unique Kauai air tour! At approximately 65-70 minutes in length, this is the ultimate in fixed wing tours of the Garden Isle. Complimentary shuttle service for cruise ship passengers is available. Please select the transportation option to request it. Transportation is only available for cruise ship passengers. Driving directions: Bear left at the 3 flags and turn right at the “Air Service Hawaii” sign. Free parking is available. 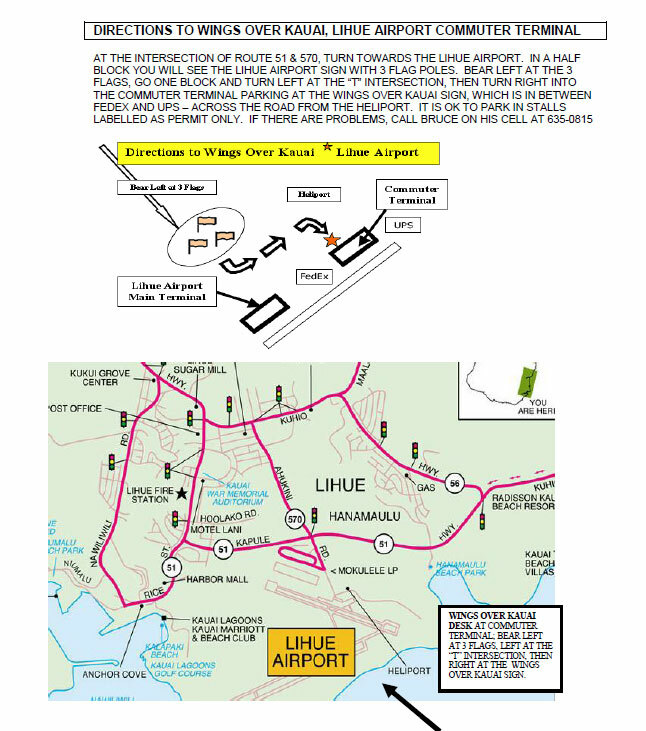 The Wings Over Kauai customer counter is located behind the area of orange seats in the terminal facing the parking lot (no sign outside the terminal).